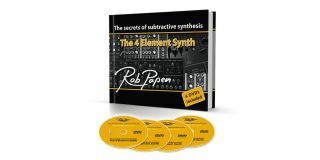 PRESS RELEASE: After more than eight years in the making, globally renowned sound designer, Rob Papen, whose sounds and virtual synths include Predator, Blue and Blade, has released his eagerly awaited tutorial package 'The Secrets of Subtractive Synthesis. In 2001, Rob Papen began giving exclusive masterclasses teaching synthesizer sound design in his studio. For these training sessions, Rob developed his own method to explain the secrets of subtractive synthesis, called 'The 4 Element Synth'. This masterclass training is now transformed into a combined book and DVD package that also delivers numerous tips and tricks to help you to design and tweak your own sounds. The 4 Elements - Oscillators, Filter, Amplifier and Modulators - are explored in detail using both hardware and software synths, with useful summary notes for each chapter, clear diagrams and handy references to the DVD. This synthesizer sound design training is an eye-opener for every synth player, from novice to pro, which will leave you with a very different and more effective approach to your synthesizers. A must have for everyone who takes their sounds seriously!